I took one last gulp of the cold, ambrosial water, then raised my gaze and surveyed the glacier. 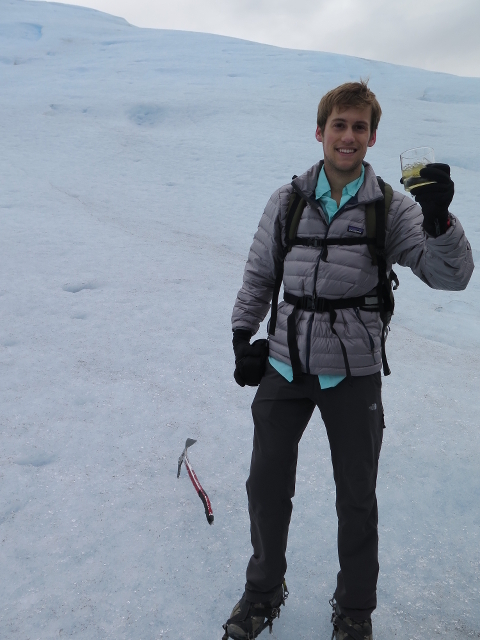 I was on my knees because I had been filling my water bottle with the cobalt blue water seeping from a little chasm in the ice, but it was a doubly appropriate posture. I was in a state of awe. 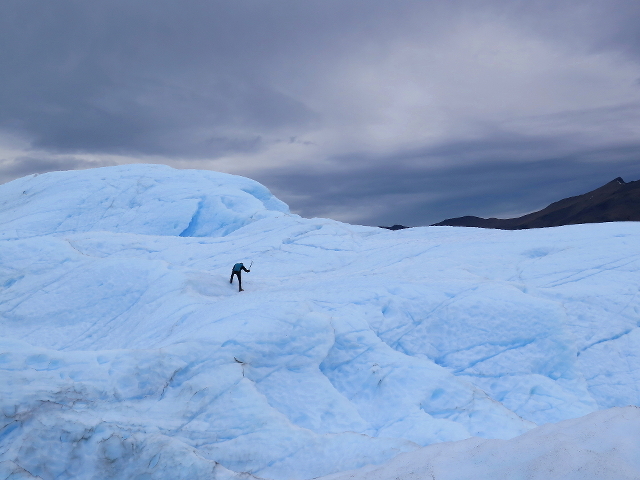 Standing on the vast undulating surface of the Perito Moreno Glacier near El Calafate, Argentina, it is not hyperbolic to say I felt I was on another planet. 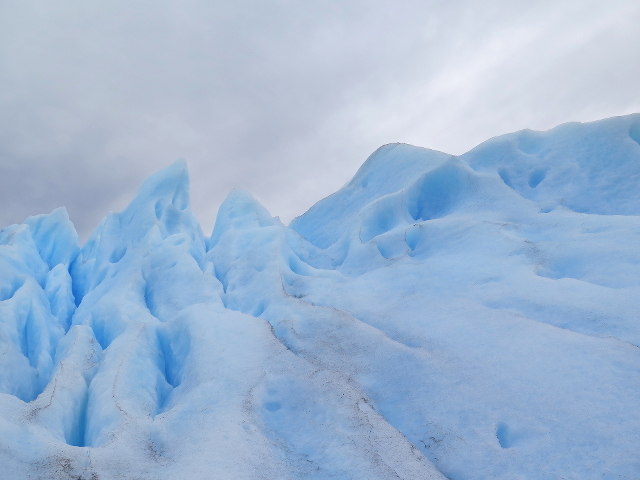 Just yesterday I took a bus from Puerto Natales, Chile, which careened past a sign that read, both accurately and worryingly: EL FIN DEL MUNDO – “the end of the world” – and now I was trekking across endless hills and ridges of swirling ice that looked like waves frozen in time. My sweltering South Texas hometown could never have prepared me for the raw, rugged beauty of Patagonia. The region encompasses much of the southern parts of Chile and Argentina, and is home to vaulting, jagged mountains; endless plains of grazing guanacos; and the third largest ice field on the planet—one that plays third fiddle only to Antarctica and the North Pole. 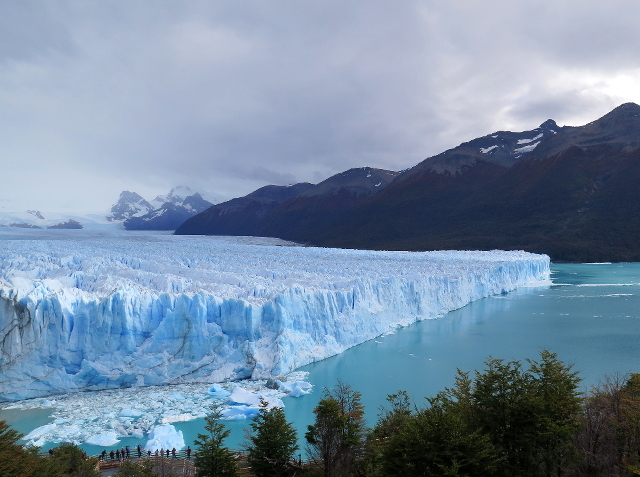 There are 48 glaciers in Patagonia’s southern ice field, of which Perito Moreno is one of the most accessible. This particular glacier spans 97 square miles, the visible boundary as wide as three miles and with an average height of 240 feet above Argentino Lake. Numbers cannot hope to make sense of this immensity. 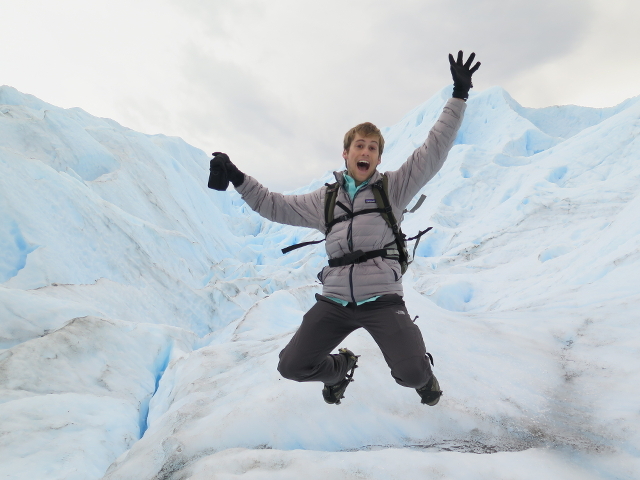 I had signed up for a tour on El Calafate’s main street the previous day, and with spiky metal crampons lashed to our hiking boots, a guide led my group carefully through the gullies and slopes of the glacier’s surface. 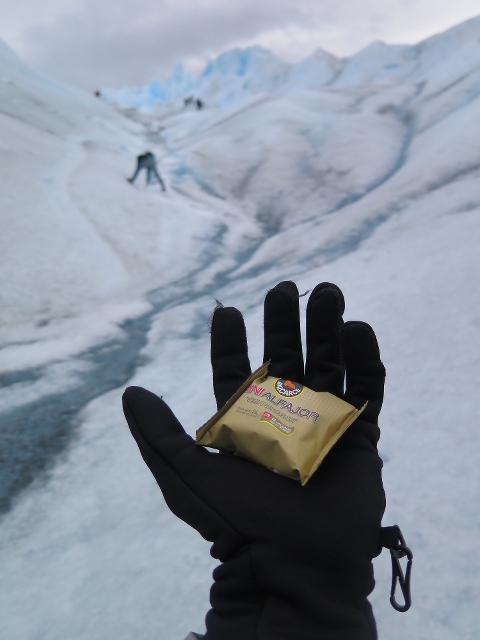 After a couple hours of climbing up icy knolls and leaping over glowing blue crevasses beneath the day’s heavy thunderheads, we met at the base of the glacier and were rewarded with alfajores (a ubiquitous Argentinean treat of two cookies filled with dulce de leche then smothered with chocolate) and the best kind of ice bar: whiskey on glacier rocks. 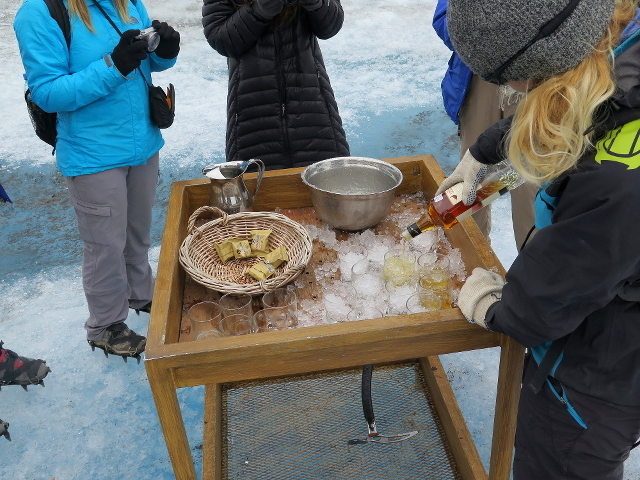 As much as I did enjoy our impromptu bar, the real treat occurred as we were ferrying back across the channel to the observation decks, passing directly in front of the massive wall of ice. Since it is one of only three advancing glaciers on the planet, it calves often, meaning it is common to see enormous chunks of ice break off and crash into the water in an explosion of white spray. But it is the sound of a calving I will remember most. As our boat shuttled us toward land, some of us had cameras glued to our faces, trying to snap a few last photos of what is a hopelessly ineffable sight, while others just leaned on the railings and soaked it all in. At that moment, a huge piece of ice cleaved from the glacier, and a deafening roar detonated through the air; first, it was like the sizzling catch of a flare, then like great branches cracking and breaking, and finally like a thundering solo of a thousand bass and snare drums. Eventually, the air and water quieted, and the glacier spoke no more. Mere minutes later, the grey clouds dissolved and the unbroken arc of a rainbow shot over the ice, resting there like a crown.